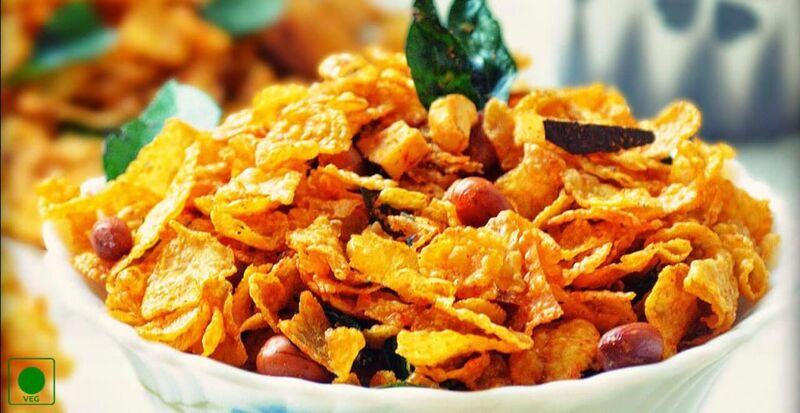 Corn flakes chivda is known as ?Makkai no chevado’ in Gujarati. This dish is simple, hassle free and quick mixture recipe for Diwali snacks that can be made in minutes. This namkeen recipe is not just only easy to make but the taste of this will delight your taste buds. Also it is healthy Diwali snack. This is very favorite among kids. Here’s for you cornflakes chivda recipe. 1. Take sufficient oil in a wok and heat it over medium-high flame. 2. When oil is heated, fry peanuts until light brown and drain them and put them on absorbent paper. 3. Now, fry cashew nuts until light golden and drain them on kitchen paper. 4. After then take cornflakes and in small batches until cornflakes expand well. Drain them well on kitchen paper. 5. Take curry leaves and fry them till crisp. 6. Now switch off the flame and finally add the raisins and fry them till puffed. 7. In a large bowl, take all fried Ingredients and add all dry spices like salt, rock salt and red chili powder. Mix them well. 8. After cooling completely store in airtight jar or container. It’s a standalone snack so enjoy when require.